Sun Lakes Arizona Golf Courses – 99 holes of golf await you in this active adult community known as Sun Lakes. Five separate communities comprise Sun Lakes including Sun Lakes Country Club, Cottonwood, Palo Verde, Ironwood and Oakwood Country Clubs. Each has their own golf course and amenities. Sun Lakes Country Club is the first of the communities and features an 18-hole course with driving range and a chip and putt facility. From the longest tees it is 3,811 yards with a rating of 55.1 and a slope of 99. Sun Lakes Country Club is private for members and their guests. Cottonwood Country Club is a Greg Nash designed 18 hole course with four sets of tees and measuring 6,570 yards from the longest. A driving range, chipping green and putting green are also available along with the well appointed Pro Shop and teaching professionals. This course is private for members and their guests. Homeowners in Cottonwood Country Club share the same homeowner association with Palo Verde Country Club. Membership is available to both courses if you live in either Cottonwood or Palo Verde. 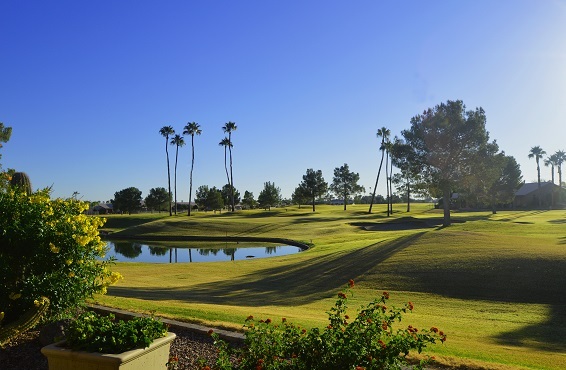 Palo Verde Country Club is an executive golf course with par 3, par 4 and par 5 holes. The blue tees measure 4,060 yards and red tees measure 3,342. A practice putting green is available as well as a Pro Shop. This course is private to members and their guests. Ironwood Country Club features an 18 hole course that measures 5,163 yards from the championship tees and 3,939 from the forward tees. The course rating from championship tees is 63.8 with a slope of 106. This course has memberships and is also public. Members receive advanced tee time reservation privileges. This course also shares the same homeowner association with Oakwood Country Club knows as IronOaks. Members have the choice of joining one club or both. Oakwood Country Club, the newest of all five communities, features 27 holes of golf. Three 9-hole courses known as the Palms, the Lakes and the Sonoran provide challenging yet different styles. The normal course rotation is Palms-Sonoran, Sonoran-Lakes and Lakes-Palms. The Palms 9 hole course measures 3,249 yards from the back tees and 2,765 from the forward tees. The Sonoran measures 3,318 and 2,388 and the Lakes measures 3,259 and 2,578. This course has memberships and is also open to the public. Members receive advanced tee time privileges. Sun Lakes Arizona Golf Courses are well maintained and all have men’s, women’s and couple league play available. Each course has dining options and bars for the 19th hole conversation and bragging rights. 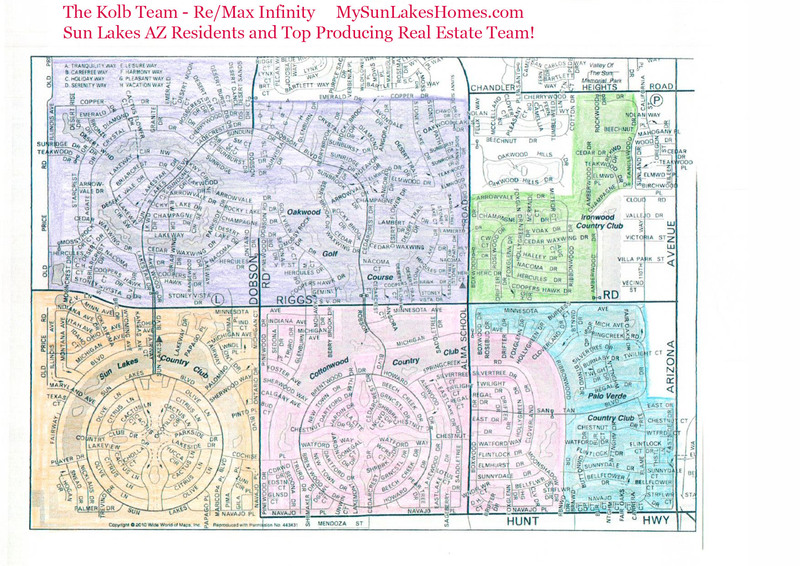 Sun Lakes is conveniently located in the East Valley of Phoenix bordering Chandler Arizona. Preview golf course lot homes in Sun Lakes Arizona here or contact us and we’ll set up a private portal and search for you. You can search all homes for sale in Sun Lakes Arizona on our website. Listings are updated in real time!